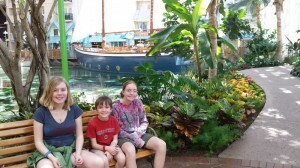 My family and I just got back from a wonderful spring break in Florida. We really needed the time together, and we were so happy for the blessing of a break and some sun! It’s been the worst winter any of us can remember, and we were ready to get out of Dodge! I had some ministry events at the end of the week, so we took the whole family and spent a few days beforehand in Orlando before heading down to Bonita Springs and Sanibel Island. I have mentioned the tough and emotional week we’d had making some ministry decisions, and it was so amazing that the day we had finally made our decision, I looked out of the hotel room and a skywriter wrote “Trust Jesus” right outside our window! God is so fun and so good. 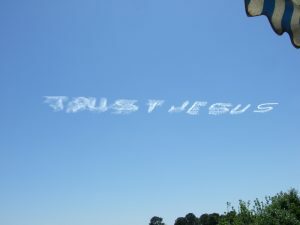 And it made me wonder how many people needed that same message as we all stared at the sky. We headed down further south at the end of the week and got to see some very close family friends, the Lunds. They are almost like second parents to me and I’ve known them my whole life. It was especially precious time too, since Mr. Lund was just diagnosed with an aggressive form of kidney cancer. We are praying hard for them, and having the time with them was priceless. Sunday morning I got to be with First Presbyterian Church in Bonita Springs again. 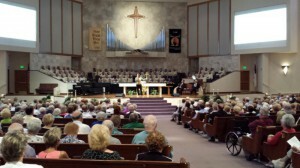 They are a wonderful church, and I have really enjoyed connecting with their worship pastor, Jeff, and the senior pastor over the years. 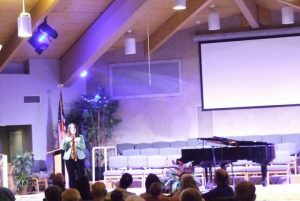 They have a pretty formal service, and they literally made me cry in their rehearsal as I listened to their 100 voice choir and amazing organ on “How Great Thou Art.” Our home church is very contemporary, and I was happy that my kids would get a chance to hear that – it was a blessing to me. I shared a little of our story and my song “Someday.” Pastor Doug had an inspiring sermon looking at Gethsemane, and it was a great morning all around for us. 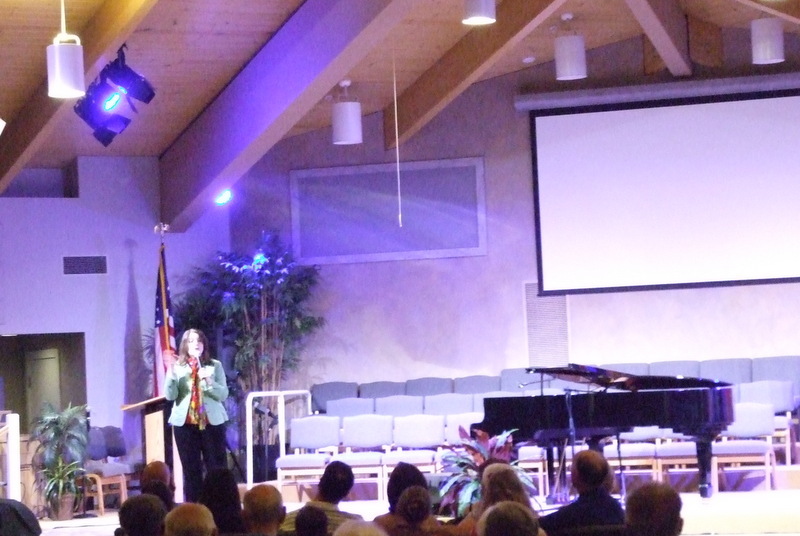 That evening, I was back at Sanibel Community Church. This is such a great place – the people just obviously love the Lord with their whole hearts, and they have this amazing, laid-back island vibe. They had built a new sanctuary since I was there last, and I was so happy for them. It was a beautiful facility, and since their original sanctuary is historic, they hadn’t been allowed to add on and were just crammed in there for multiple services. We had a great night of ministry, and everyone from the church (especially you guys, Patrick and George – you know who you are!) were such a blessing to us all! We drove about 4 hours after the concert, and then another 14 the next day to get home. That was crazy! And drove through one tornado warning in GA to boot. But it was such a great week with my family, and I’m so glad we were able to go! This entry was posted on Tuesday, April 8th, 2014 at 12:40 pm	and is filed under News. You can follow any responses to this entry through the RSS 2.0 feed. You can leave a response, or trackback from your own site.